This entry was posted in News and tagged news on January 9, 2015 by Meredith. 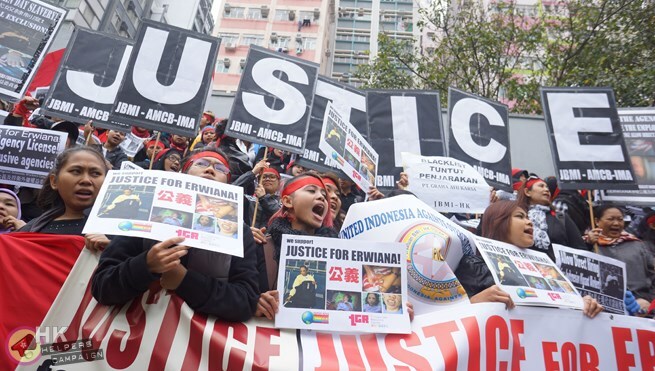 Share the post "NEWS – “She Slept on the Floor”: Defendant’s Son Testifies at Erwiana Abuse Trial"
The son of Law Wan-tung, the woman who stands accused of abusing Erwiana Sulistyaningsih and two other Indonesian women who worked in her home, testified at the District Court yesterday that he did not see his mother be physically violent with the women. The court heard 18-year-old Edward Tsui Wing-kit describe how the women, who worked for his mother at different periods between 2011 and 2014, would typically still be cleaning when he went to bed at midnight. Tsui said that he could not recall if any of the women were working when he woke up at 7am to prepare for school. He did not know how many hours a day the women worked. “She slept on the floor on a piece of carpet,” Tsui told the court of Erwiana’s living conditions. He explained that Erwiana slept in a closet full of shopping bags, which she would have to remove in order to make space. To reprimand the women, Tsui explained that his mother would be gentle and insist that they perform their duties better, and he did not believe that she was violent with them. He told the court that his relationship with the women who worked in his home was ‘normal’, though said he was not close to them and rarely spoke with them. Tsui denied that his mother restricted the movements of her employees, telling the court that Erwiana was able to leave the premises when she took out the rubbish. He also told the court that his mother said Erwiana wanted to make more money in lieu of taking rest days and public holidays. The prosecution and Tsui disagreed on the existence of a feather duster, which former employee Tutik Lestari Ningsih testified was used to hit her. When prosecution counsel Louisa Lai inquired how Tsui knew there was no feather duster, he replied that his mother had told him. Lai asked if it was true that he did not care much about Erwiana. “True,” agreed Tsui. Tsui told the court that Erwiana had acne and under eye circles when she came to work for the family in May 2013, though her under eye circles became worse during her employment. He said that he was not alarmed when Erwiana’s skin ailments became worse. Law, 44, decided not to take the stand in her defence. Three other witnesses for the defence are slated to take the stand, including Law’s teenage daughter, a friend of Tsui, and a tutor who used to visit the home. Counsel for the defence petitioned Judge Amanda Woodcock to reduce the charge for grievous bodily harm with intent and to remove two other charges against Law. After deliberation, Judge Woodcock announced that all 20 charges would stand.